Just exactly what, some may wonder, is pavlova? Anyone who has ever tasted it quite likely would say a very light and airy tasting dessert made of meringue and fruit. Very popular in Australia, hardly heard of in America. The origins of pavlova trace back to a tour of Australia and New Zealand by premier Russian ballerina Anna Pavlova in the 1920’s. The answer to which of the two countries invented it likely depends upon which country you are in when asking the question. When I visited Australia, the people there said an Australian chef invented it to serve to Anna Pavlova, but searching online for what chef and where brought up more questions than answers. The dessert and the name of it appearing around the time of her tour is about all that seems in agreement. My daughter, who lives in Australia, sent me her Australian husband’s grandmother‘s pavlova recipe. It is easy to make and quite delicious. The original recipe said to grease the plate it bakes on and dust it with a mix of cornflour and icing sugar, which we don’t have here in America. I found that substituting cornstarch and powdered sugar just does not do the trick. It sticks the pavlova to the plate like glue. After experimenting with various ways of unsticking the pavlova that did not work, I discovered that parchment paper works wonders. No greasing or dusting involved, just the paper. Lifts right off the plate. Sheri says this recipe has less sugar than most, but it tastes great the way it is and does not need more. Beat egg whites with a pinch of salt until stiff. Slowly add sugar a little at a time, beating well. When thick and fluffy, fold in cornstarch, then vanilla and vinegar. Place a piece of parchment paper on an oven-safe dinner plate. Leave enough paper overhanging the edges to make it easy to lift the whole thing off the plate after baking. Spoon eggwhite mixture into a mound on the plate. Bake in oven preheated to 300 degrees fahrenheit (150 degrees C) for 20 minutes. Turn heat down to 265 degrees F (130 degrees C) and continue baking for 1 hour. When finished turn heat off, but do not open oven. Leave Pavlova in there until completely cooled, preferably overnight. Use the extra parchment paper left sticking out beyond the plate to lift the pavlova off the plate. Peel the parchment paper off the bottom of the pavlova, and place it back onto the plate. Refrigerate until ready to use. When ready to serve, top with whip cream. (About a cup to a cup and a half before beating should be enough.) Beat in a teaspoon or so of vanilla after the cream stiffens enough to form peaks. DO NOT use the pre-whipped spray whip cream in a can. It turns to liquid and makes a big mess. After spreading cream over the top of the Pavlova, decorate with whatever fruit or berries strike your fancy. My favorite is kiwi with strawberries and blueberries. Sheri’s favorite is frozen raspberries (still frozen when added to the Pavlova and eaten,) fresh strawberries, bananas and dark chocolate. For lactose intolerant folks who want a non-dairy dessert, substitute cool-whip or similar topping for the whipped cream. It will keep in the refrigerator for up to a couple of days with the cream and fruit on it. If you just have a couple people to feed and don’t want such a big pavlova, make 2/3 of the recipe and bake it on an 8 1/2 inch plate. If you need to feed a big crowd, use 1 1/2 times the recipe and bake it on a pizza pan. You may need to adjust the baking time a bit for the smaller or larger pavlova. You can decorate it any way you like with the fruit. Scatter it randomly, or arrange it artfully in patterns or in ever increasing rings circled out from the center. I once made one for a Halloween potluck that resembled a giant bloody eyeball. The trial one I made to see if it would work had blueberries at the center for the pupil, surrounded by kiwi for the iris. The outer area, or white of the eye, had streaks of strawberry ice cream sauce and bits of strawberries to resemble blood and blood clots. 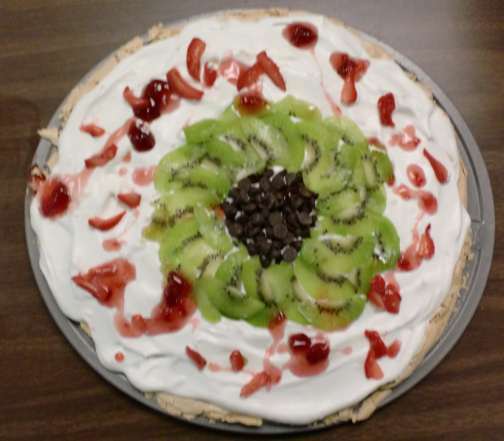 When I went to make the real thing for the potluck, I could not find fresh blueberries anywhere, so I substituted dark chocolate chips for the pupil. The people there had never heard of pavlova before, but they loved it. 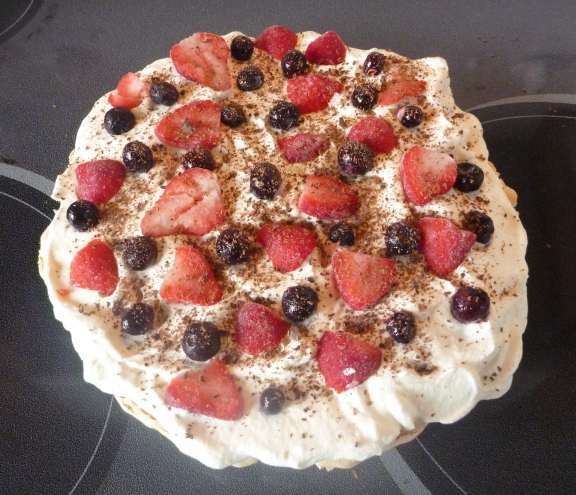 This entry was posted in Australia, recipes and tagged Australia, Australian dessert, dessert, food, gluten free, lactose free option, Pavlova recipe, photos, recipe. Bookmark the permalink. Your articles are very interesting. The desseert does look pretty. Sorry about the wrong spelling of dessert –forgot to proof-read. And why is there a scary photo next to my e-mail and name when I typed them in? I didn’t have the pavlova when you were here last. Maybe I will have to time the next trial of the gluten-free beet brownies to your next visit (they taste a whole lot better than that sounds). Something for a future blog. WordPress puts in the pictures. It did give you an ugly one. The pavlova base is good but everyone wants to make it a fruity dessert. That garnished pavlova looks good if you leave the berries off. You can put whatever you like on it. Yours would probably just have bananas and chocolate. Oh maybe some mango too. Question…. I just made this Pavlova for the second time. I did 1.5 the recipe. And for the life of me I’m not sure I did the correct amount of sugar. Will the ruin the entire thing? I am serving with a sweetened whipping cream, raspberries blackberries and a sweeten raspberry glaze I drizzle after serving. I’m hoping all the sugar in all of the toppings will make the difference ?? This recipe is lower in sugar than the average Pavlova and it tastes just as good so it shouldn’t matter too much if the amount isn’t exact.